It hasn’t seemed so long, but we’d been in Mesa six weeks yesterday. We did have a feeling we’d been here awhile — we’ve both been getting itchy feet for the last week or two. So we started making lists to help get us ready for departure. That’s right, we’re checking our list carefully before we head back East. We’d hate to get a couple of thousand miles down the road and then realize we left something behind, like the RV. These things are avoidable, you know? We both are list-makers for any number of purposes. We’ve been accused of being extremely linear (I think it meant I always added 1 + 2 before I did anything to 3). You could, at any given time in our RV, find a couple of active to-do lists and a grocery list (for the things we didn’t find and the things we’ve since discovered we wanted). We have a pre-flight list of things we’ll do before we leave Mesa. The big things are arranging the radio antennae for the trip, programming the amateur radios for enroute repeaters, setting tire pressures for all eight tires for highway driving, dumping the RV’s two holding tanks, securing all loose items in the RV, donating clothes to local Charity, and getting groceries for the 2,300 mile ride. We have only a couple of loose ends with the resort park office, like turning in our mailbox key, paying our electric bill, submitting the mail forwarding request. Jim has one more tennis match tomorrow morning. Deb wants to play tennis one more time before we leave. We’d love to get the truck (and maybe the Airstream) cleaned up before the drive. Clean windows, floor mats, and a clean hood are all we really need — we can’t see the rest of the truck from our truck’s seats anyway. And it’s nice to at least clean the windows and door on the Airstream, if we can’t get it all washed before we leave. We’re facing a long four days, or we may take a fifth day, for the 2,300 miles from Mesa, TX, to Kannapolis, NC. Yet we’re looking forward to the drive, the scenery, the change. And we’re especially excited about returning to green North Carolina. Mesa, and Towerpoint particularly, has been wonderful. We enjoyed so much here, from Frank Lloyd Wright’s Taliesen West to Scottsdale’s Old Town and the Sugar Bowl; desert hiking with friends from Towerpoint and visiting Tempe; finding our way around vast metropolitan Phoenix; playing tennis every day and having nice soaks in the park’s hot tubs. 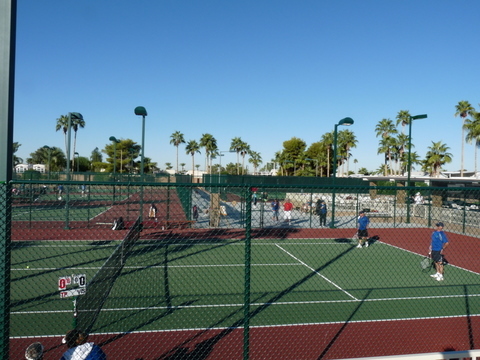 We’ll miss the tennis club facilities and people, just 100 yards from our RV. We’ll miss the interesting and changing desert weather. We’ll miss our Towerpoint friends and our fun times with them. We’ll look forward to another season here, another time. Now it is time for us to go. Let’s go somewhere. Six weeks is a long time to stay.